Over two years Garni community residents in Kotayq Region have been fighting against the Qaghtsrashen gravity irrigation system, through which a part of the water in the Azat River should be transferred to Ararat Region for irrigation purposes. 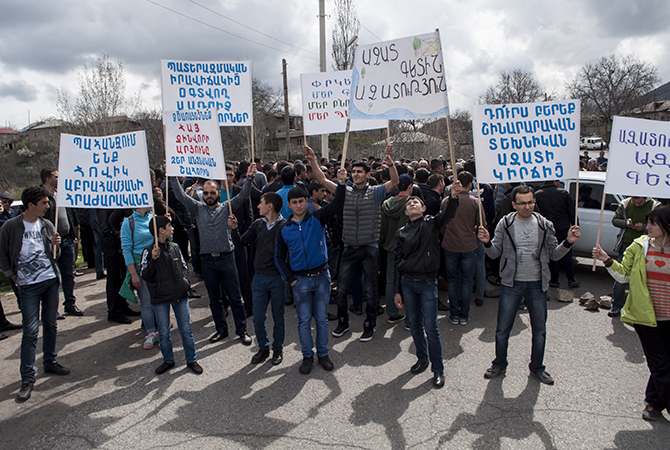 During recent two years Garni residents blocked Garni-Yerevan highway several times, failed the public discussions organized by State Committee on Water Industry and sent a letter-complaint to the Washington office of the World Bank, which funds this project. Only when ex Prime Minister Hovik Abrahamya promised to stop the implementation of the project, Garni residents stopped their harsh fight. Today Garni residents don’t consider their matter to be finally resolved. They continue their fight for changes, this time in local government elections. They are sure that they should be active in all the matters concerning the community to achieve success. For this very reason activist Arusyak Ayvazyan has been running as a candidate for a community head. Garni resident activist will fight for the office of a community head with the current community head, who supports the implementation of Qaghtsrashen project. The elections of the community head will be held in Garni on 2 October.